Scott Carpenter wasn’t about to play hero right away at the Brown University Northeast Cross Country Championships on Saturday. With a talented field that featured several runners capable of traversing over Goddard Memorial State Park’s generous five-kilometer layout in the low 15-minute range, the senior from Lenox High was content with just hanging with the lead pack and making his move in the late stages. Never departing from that plan, Carpenter came away with the victory in the boys’ championship race, cruising through the muddy course in Warwick, R.I., with a solid personal-best of 15 minutes, 15.2 seconds. The slender runner with the long stride broke from a pack of five at mile 2 that included one of the pre-race favorites and eventual second-place finisher, Trevor Crawley of Cumberland (R.I.) High. Crawley, a senior, registered his fifth sub 16-minute race of the fall with his runner-up time of 15:28.5. Crawley was hoping to contend for the title, and certainly had the confidence it was possible. Earlier this season, he posted a course record and PB of 15:15.8 at the Blackstone Valley Invitational. The meet was held at Burrillville Middle School on a similar course as the Brown Invite. Once Carpenter made his final move for the crown, Crawley knew it would be difficult to become one of the first Rhode Islanders in recent memory to snag the crown. Bunching its top five varsity runners among the first 12, last year’s runner-up St. Anthony’s High in New York earned team honors with a 43-77 triumph over four-time defending champion Pembroke (Mass.) High. 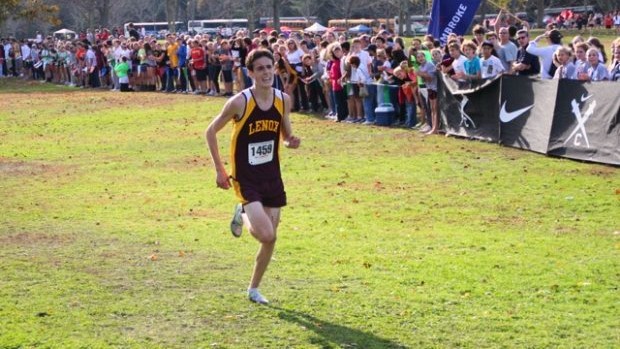 Taking the sixth through eighth slots for St. Anthony’s were senior Patrick Ginty (15:50.6), senior Jake Hensley (15:55.7) and sophomore Patrick Tucker (15:58.3). The more than 2,400 participants that competed in the all-day meet, which also featured varsity, junior varsity and freshmen races, were welcomed to sunny skies and a temperature in the mid-70s. But they also had to deal with a wet and slippery course due to the heavy, overnight rainfall. The conditions didn’t bother Tiana Guevara, a junior from Miller Place High in Long Island. Guevara took the pace out hard from the gun and held the lead nearly the entire way en route to the girls’ championship title with a PB of 18:12. Guevara outdistanced senior Sabrina Southerland of Benjamin Cardozo High in N.Y., who was second at 18:19.6. Denise Branch, also of Benjamin Cardozo, was third with a time of 18:28.8. Guevara wasn’t expecting to come away with the win. Guevara took the aggressive approach in her race. Barrington, the defending R.I. state champions and a third-place finisher at the Brown Invite in 2011, demonstrated its outstanding depth at the meet by taking the team title. Led by a seventh-place effort from Abby Livingston, the Eagles defeated the Bay State’s top-squad, Whitman-Hanson High, 61-88. 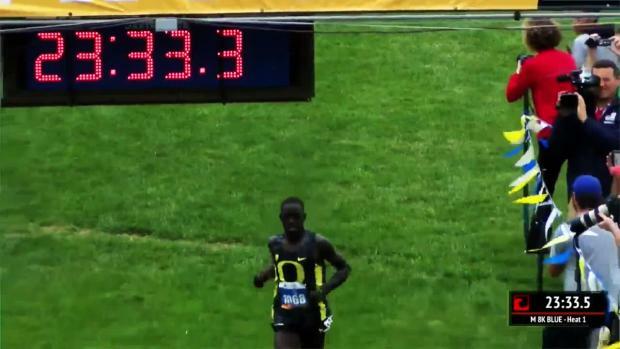 Livingston was clocked in 18:37.8. Teammate Fiona Paine was 10th among the 67 finishers at 18:44.8. As a team, Barrington averaged a time of 19:07.2 for its scoring runners. 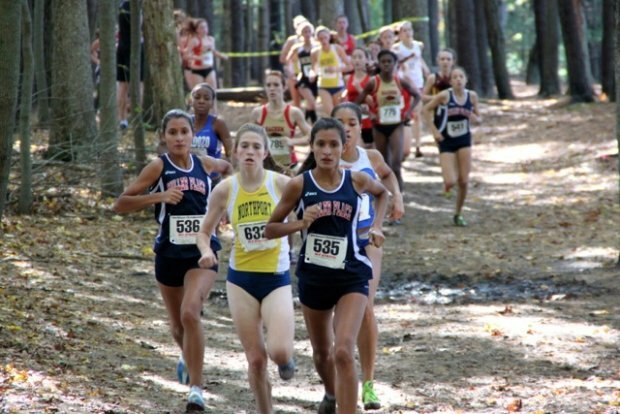 Four of the Eagles’ harriers placed in the top 13. Livingston found herself in about 25th place before the mile mark. She worked her way to her final placement with a strong kick the final quarter mile. In the other varsity competitions, Ryan Udvadia of Shoreham Wading River (N.Y.) High, copped the Varsity Div. 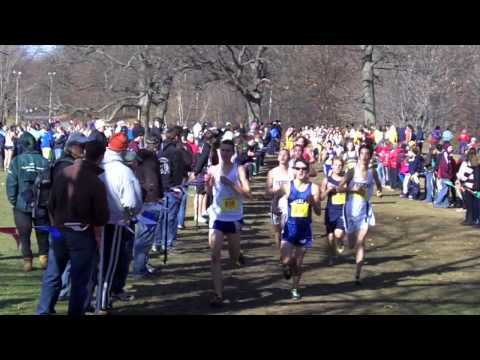 I boys’ race in 15:50.8 and Tom Meehan of Eastport South Manor (N.Y.) High was the victor in Varsity 2 at 15:41.9. Kerri Keohane of Tyngsborough (Mass.) High won the Varsity I girls’ race in 18:33.2 and Amanda DeLaCruz of Port Richmond (N.Y.) High was first in Varsity 2 with an 18:38.8 clocking.